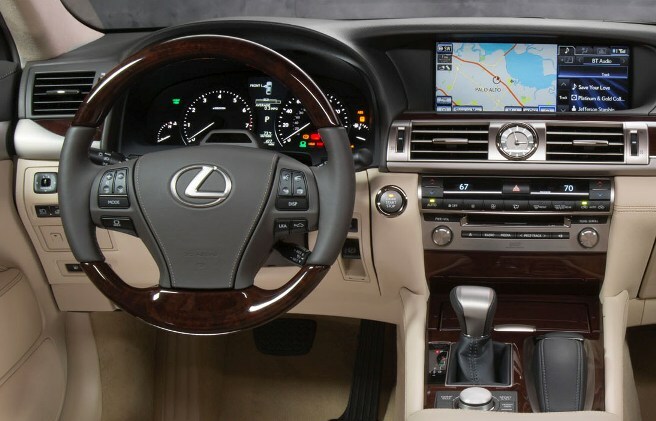 Available safety enhancements include the Pre-Collision Safety (A-PCS) system with Collision Avoidance Assist. designed to assist the driver in avoiding or mitigating collisions with vehicles and pedestrians under a wide range of city and highway speeds. At speeds lower than 24 miles per hour, this technology helps the LS to avoid accidents by automatically bringing the LS to a full stop. Available Adaptive Cruise Control (ACC) constantly monitors the distance to vehicles ahead and is capable of operating at any speed. The system can bring the vehicle to a complete stop, and accelerate away once the road ahead is clear. An upgraded, optional Lane-Keep Assist system helps the driver stay in the intended lane. New to LS, the Blind Spot Monitor uses rear millimeter-wave radar to monitor the vehicle rear side blind spots at 10 miles per hour or more. This feature includes Rear Cross Traffic Alert (RCTA) which automatically operates when the vehicle is in reverse, alerting drivers to the approach of other vehicles when backing out of a parking place. General Motors said that Global Chief Marketing Officer Joel Ewanick has elected to resign effective immediately. Word is that it may have been related to his negotiation of a marketing deal with the Manchester United soccer team. GM announced that Chevrolet will be Manchester United's shirt sponsor beginning with the 2014/2015 season replacing Aon. The seven year deal makes Chevrolet, the current Official Car Partner of the Club, only the fifth shirt sponsor in the Club’s 134-year history. 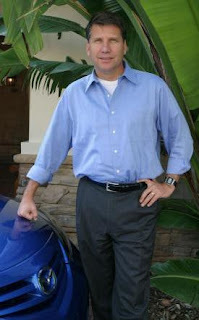 Ewanick, 52, joined GM in May 2010 in charge of marketing for the company’s North America unit. He was named global chief marketing officer in December 2010. Prior to joining GM, Ewanick was vice president of marketing and chief marketing officer for Nissan North America. Before joining Nissan, he served as vice president of marketing for Hyundai Motor America. Alan Batey, vice president, U.S. Sales and Service, will assume the role of global chief marketing officer on an interim basis. The J.D. Power and Associates 2012 U.S. Automotive Performance, Execution and Layout (APEAL) Study which examines how gratifying a new vehicle is to own and drive, based on owner evaluations of more than 80 vehicle attributes, has Porsche the highest-ranking nameplate for an eighth consecutive year. The study also finds that 27 percent of new-vehicle buyers who replaced a vehicle downsized, in other words, they purchased a new vehicle in a smaller segment than the vehicle they replaced while only 13 percent of buyers "upsized," and 60 percent purchased a new vehicle in the same size segment as their previous vehicle. The vehicles currently being traded in for new ones are approximately six years old, on average, according to data from J.D. Power's Power Information Network®. During that period of time, vehicle appeal overall has significantly increased, and today's smaller vehicles are, in many cases, more appealing than the larger vehicles being replaced. 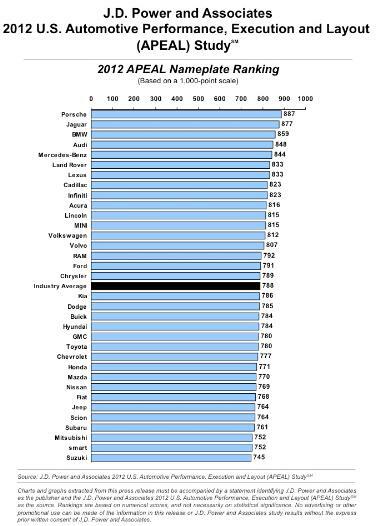 In 2012, the average APEAL Study score for vehicles in the compact/sub-compact segment is 765 points (on a 1,000-point scale), which is the same as the average for midsize vehicles in the study in 2008. Similarly, in 2012, the average APEAL Study score for vehicles in the midsize premium segment is 844, the same as the average for large premium vehicles in 2008. The downsizing trend also has an impact on owner satisfaction with the fuel economy of their new vehicle. While overall vehicle appeal continues to improve, increasing seven points year over year, the greatest improvement is in fuel economy. Forty-seven percent of owners say gas mileage was one of the most important factors in choosing their new vehicle, up from 40 percent in 2011. Chevrolet receives the highest number of segment awards of all brands included in the study for the Avalanche, Sonic and Volt models. Seven brands each receive two model awards: Audi (for the A6 and A8); Dodge (Challenger and Charger); Ford (Expedition and Flex); Kia (Optima in a tie and Soul); MINI (Countryman and Coupe/Roadster); Nissan (Frontier and Quest); and Porsche (Cayenne and 911). The Audi A8 achieves the highest APEAL Study score of any model in the industry in 2012. Also receiving awards are the BMW 3 Series; Infiniti QX56, Range Rover Evoque; Mercedes-Benz SLK-Class; and Volkswagen Passat in a tie. With four years of losses due to a rising yen and slumping sales in markets outside the U.S., Mazda Motor Corp. has been cutting employees at a hefty rate. Reports are there have been more than a hundred hand shakes already at their Irvine, California, North American headquarters which did employ about 700 before the severances. One report has their reduction target at 550 for Mazda North American Operations. The cuts are also underway in Europe with no reductions expected in Japan, according to published reports. One Mazda star exec, Don Romano, 51, President of Mazda Canada, who was given the role of U.S. Chief Marketing Officer in March of 2010 then had it stripped away recently, departed Mazda last week. Romano, a southern California native living in and liking Toronto, was president of Mazda of Canada from April of 2006 until "he elected to leave" last week. He had held various roles within the organization working on brand development, business planning and global integration since joining Mazda in 2000. Expect Romano to re-surface very soon in a new position. Shusuke “Kory” Koreeda, a 32 year veteran of Mazda and most recently Executive Vice President of Mazda Canada, has been named interim President of Mazda Canada succeeding Romano. Koreeda has served in a variety of executive positions at MC in Japan and with Mazda North American Operations in the United States. Mazda Motor Corp. has the biggest losses among Japan’s eight biggest carmakers and has been looking for ways to boost capital. It was recently announced that Mazda and Fiat are partnering for the development and manufacturing of a new roadster for the Mazda and Alfa Romeo nameplates based on Mazda's next-generation MX-5 rear-wheel-drive design. The basic Ford F-450 has a 390 horsepower turbocharged 6.7 liter Power Stroke V8 diesel engine mated to a six-speed automatic transmission and sells for $49,395. Those F-450's have four-wheel drive with Crew Cabs and 8 foot bed. This special Chartis Property and Casualty Ford F- 450 is one of six trucks that are designed to service their insurance clients who are threatened by wildfires. At a cost of nearly $200,000 these trucks carry 200 gallons of water and another 200 gallons of Phos-Chek fire retardant. Fire prevention to save homes saves lives, irreplaceable valuables and huge insurance claims is the mission of this Ford F-450. The all-new 2013 3 Series Sports Wagon, slightly larger than its predecessor, will launch in Europe later this year and is set to arrive in US showrooms in the Spring of 2013. The BMW 328i Sports Wagon will have a 240 horsepower 4-cylinder TwinTurbo engine, 8-speed automatic transmission with the same option choices as the recently introduced 328i sedan. Larger dimensions produce nearly ten percent more cargo volume both with the rear seats up and when folded. The new BMW 3 Series Sports Wagon again features a rear window that opens separately from the tailgate. In addition to the standard trim level, the new BMW 3 Series Sports Wagon can now also be specified with any of three equipment lines or an M Sport Package. The new BMW 3 Series Sports Wagon is equipped with an Auto Start-Stop function, which automatically switches off the engine during short stops at traffic lights or in stationary traffic, so as not to waste fuel.The BMW 328i xDrive, all-wheel-drive models will go on sale at launch along with the introduction of the rear wheel drive 328i Sports Wagon. Pricing details and standard/optional equipment will be announced closer to the on sale date. Sergio Pininfarina, the great Italian car designer who was almost synonymous with Ferrari died yesterday at age 85 in Turin, Italy. 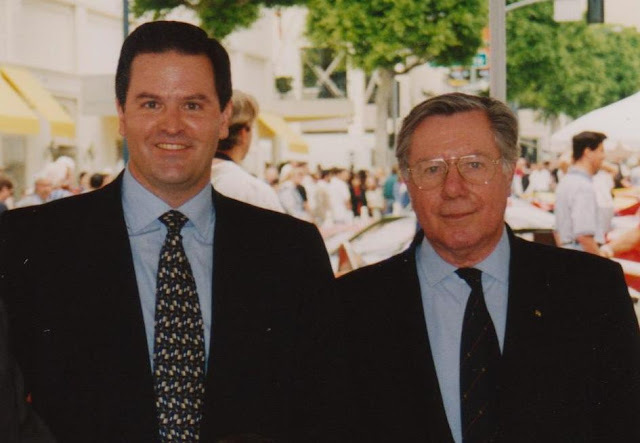 Pininfarnia is pictured above with this reporter at the 1997 Beverly Hills Rodeo Drive Ferrari Concours d'Elegance where 175 Ferrraris of all vintages were on display. Among his design credits are the Fiat 124 Sport Spider, Alfa Romeo Spider, Ferrari 250 and 500, Dino, Daytona, 356 and Modena. Pininfarina, the company, was founded in 1930 by his father, Battista "Pinin" Farina, who later changed the family name to Pininfarina, to design cars for Fiat, Alfa Romeo, Lancia, Cadillac, Rolls-Royce and Volvo. The fame was with Ferrari, designing nearly all of its models since the 1950's. Sergio Pininfarina was born Sept. 8, 1926, in Turin and joined the family business after earning a degree in mechanical engineering from Turin Polytechnic in 1950. He became general manager in 1960, managing director in 1961 and president in 1966, the year his father died. Yesterday we lost a car design legend. General Motors reported June sales of 248,750 vehicles in the United States, up 16 percent year over year and it’s highest sales since September 2008. Chevrolet, Buick, GMC and Cadillac all reported double-digit increases. Year-to-date GM has sold 1,315,713 vehicles, a 4.3 percent increase over 2011. Ford Motor Company’s U.S. sales June sales of 207,759 was an increase of 7 percent over last year. So far this year, Ford sales were 1,098,421 also an increase of 7 percent from last year. Toyota Motor Sales, U.S.A. reported June 2012 sales results of 177,795, an increase of 60.3 percent from the year-ago month.The Toyota Division posted June total sales of 157,773, an increase of 57.5 percent from the year-ago month. For the first half of the year, TMS reported sales of 1,046,096, up 28.7 percent during the first half of the year. Chrysler Group reported U.S. sales of 144,811, a 20 percent increase compared with sales in June 2011, the group's best June sales since 2007. Through the end of June, Chrysler Group total sales are at 834,068, for a 30 percent clip ahead of 2011. American Honda reported June 2012 U.S. sales of 124,808, an increase of 48.8 percent compared with June 2011. The Honda Division posted June 2012 sales of 109,438, an increase of 45.6 percent compared with June 2011. Acura's U.S. June sales of 15,370 increased 76.5 percent compared with June 2011. Nissan North America reported June U.S. sales of 92,237, up 28.2 percent. Nissan Division sales increased 24.6 percent for the month at 81,801 units. Sales of Infiniti vehicles were up 66.1 percent over the prior year, to 10,436. 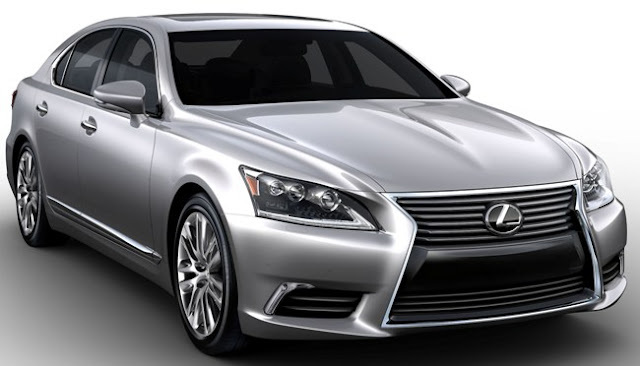 Year-to-date total sales for Nissan and Infiniti are 577,721, a 14.4 percent gain over last year. Hyundai Motor America announced an all-time June sales record of 63,813, up 8 percent over last year's all-time June record. For the first half of the year, sales are up 10 percent to a record 356,669 units, with retail sales up 13 percent. Kia Motors America had its best-ever June sales of 51,326, a 13.9-percent increase over the same period last year. Year-to-date sales of 288,707 is up 17.8 percent over 2011. Volkswagen of America reported 38,170 June sales, a 34.2 percent increase over prior year sales and year-to-date, VW has sold 208,725 vehicles, a 35.4 percent increase for the best June and best first half since 1973. Separately, Audi announced it sold more vehicles in June 2012 than in any month since entering the U.S. market 42 years ago. The new all-time monthly U.S. sales record of 12,664 vehicles was an increase of 26 percent over June 2011. For the first half of 2012, Audi sales are 65,158, a 16.5 percent gain. The BMW Group in the U.S. (BMW and MINI combined) reported June sales of 27,720, an increase of 3.2 percent from the same month a year ago. Year-to-date, BMW Group is up 10.5 percent on sales of 158,563 in the first six months of 2012 compared to the same period in 2011. Subaru of America reported record sales for June 2012 of 27,702, a 40 percent gain over June 2011 with year-to-date sales of 164,304, a 24 percent gain over prior year. Mercedes-Benz USA reported combined sales of 25,388 with "Best Ever" months for its Mercedes-Benz, smart and Sprinter model lines. The 12.5 percent increase for the month brings the year-to-date total to 142,619, up 20.8 percent and making this MBUSA's highest first-half on record. Mazda North American Operations reported June U.S. sales of 19,911, an increase of 3.1 percent versus last year. Year-to-date sales through June are up 17.5 percent versus last year, with 143,797 vehicles sold. Volvo Cars of North America sales of 7,107 in June was just 7 vehicles more than in June 2011, while year-to-date Volvo sales are 34,618, a 5 percent drop from the first six months of 2011. Mitsubishi Motors of America sold 5,411 in June, a 35 percent drop from June 2011 and for the first half of 2012 has sold 32,873 vehicles, down 26 percent from the same period last year. Jaguar Land Rover had sales of 4,632, a 2 percent increase with Jaguar sales at 1,030 a 26 percent decline and Land Rover at 3,602, a 14 percent gain over last June. Year-to-date, JLR sales are 27,496, up 16 percent with Jaguar at 6,506, up 2 percent over the first six months last year and Land Rover at 20,991, up 21 percent from 2011. American Suzuki Motor reported June 2012 sales of 2,299 units, up 1 percent from last year. Porsche Cars North America announced June 2012 sales of 3,002 vehicles, an increase of 18 percent. For the year, Porsche has sold 16,450 cars in the U.S., a six percent increase over last year.